What is special about February? February was named after the Latin term februum, which means purification. February is the second month of the year in the Julian and Gregorian calendars. It is the shortest month. It is also the month when Valentine’s Day is celebrated. But more importantly, it is about that time of the year when New Year resolutions are broken, if not already forgotten. There is nothing more synonymous with New Year than New Year resolutions. It sounds funny to me that people actually believe they will be able to change old habits and create new ones overnight. On 31st December night, the person is fat and lazy and goes to bed late and fully drunk. From the time he wakes up on 1st January morning, he expects to lose weight, be more hard working and give up drinking. Can 6 to 7 hours of careless sleep change a person so dramatically for Pete’s sake? Rather, for their own sake? I think that a New Year's resolution is something that goes in one ‘year’ and out the other. My guess is that people would have forgotten all about them by February. This is the time people end up making a 'new start' to their 'old habits'. As Oscar Wilde said resolutions are simply checks that men draw on a bank where they have no account. A few years ago, I resolved to be more decisive. 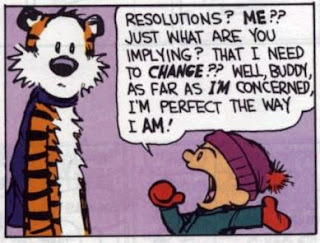 But I could not decide on any other resolutions though! But since then, my resolution has been not to make resolutions. So I have made no new resolutions for this year too. My computer’s resolution remains at 1280X800, while by DSLR’s is 12.2 MP. The act of making plans, setting deadlines, of criticizing, sanctioning and molding my life, is something that my wife does on a daily basis for me. But things have changed this year. My wife’s New Year resolution this year was to stop telling me what to do all the time. Just that along with her resolution, she made mine too! I believe one doesn’t need an excuse to start or stop something that one believes in. But there is nothing wrong in making a resolution (any time of the year!) if one intends to stick to it. Like my friend who insisted that she would not make any resolutions this year, since she was still working on all those she made in the previous years. In fact, if you look carefully, there is a solution lurking in re’solution’ itself. Having condemned New Year resolutions and given you tips on how to keep a resolution, here’s wishing that all your troubles last only as long as your New Year resolutions! Gladder still, that I am working on all those resolutions of an aeon ago, so that I have no more space to add on the list of resolution. And finally, it is redemption this post gives... that I can happily forget, all those solutions to re'solve' problems any and everywhere, till the next New Year! Hey buddy I had made a few resolutions and I think I am on course.Don't put ideas into my mind and make me change course. Thankfully, I did not work on any solution or resolution this year. Your posts always leave me fresh...like the new year. Both funny as well as thought provoking. I like such stuff. Have you read "CHO" Ramaswamy's articles? (Tamil). They would be very funny on the outer, but very profound. interesting thoughts, I totally agree that resolutions have become more of a fashion and less of an edification. Your blog is interesting to ready, i like it. LOL! Another of your gems, Salil. I totally agree with the art of not making them! However, I did make some this year, and as they were rather simple ones, I've even fulfilled a couple of them!! And, I loved your concept of monthly resolutions...makes them more attainable. I really am intrigued at how you go about writing a post. Do you keep all the points, the one-liners, and the humorous asides at hand or do they occur to you as you type?? Every paragraph of yours has at least a couple of witticisms and an out-of-the-box way of looking at things. I admire your skill Salil. brand new one for each month....that way you wont even remember what was Jan resoltion when you reach Dec.
"I think that a New Year's resolution is something that goes in one ‘year’ and out the other"
Come on Salil, we want more!! Its been 3 weeks since you posted this one. Keep up the writing Salil. I am glad that this post would have lessened the burden of the unfinished resolutions. That is the advantage of calling the rules wrong, so that you don’t have to abide by them. Not sure how you can come up with ‘few’ resolutions every year, assuming you achieve them. I am assuming that you are not carrying them forward, in which case it is a futile exercise. Good luck with them, anyway. Good for you. I believe you are better off without the guilt feeling of having broken them. Thanks buddy. I have not read ‘Cho’, but have seen his ‘Arattai Arangam’ a few times. Welcome to this space and thank you for your comments. Hope to see you around. Glad to hear somebody achieving their resolutions. Probably they were something you would have achieved even without the resolutions – just my guess. People don’t remember the resolution while continuing with their ‘actions’ or ‘habits’ they resolved to change, they remember the resolution after the action. Glad you agree. Good for you. The resolutions leave a bitter feeling of guilt and nothing else. What a silly question – have you ever seen a wife who leaves a husband unmonitored, ha! There you go. New one has been posted.